Exterior caulk can help protect your home from damage. There are many different types of caulk on the market, so make sure you find the best exterior caulk for your home. Caulk is a flexible material that is used to fill expansion joints and gaps inside and outside of your home. On your home's exterior, caulk is used to prevent moisture and air from entering your home through cracks. Caulk is also used to seal up small gaps in your siding or around window casements, which could lead to moisture damage if left unfilled. Any of these areas may allow wind, rain and snow to enter your home, raising your energy bills and potentially allowing mold, mildew and rot to enter your walls. Filling these gaps with caulk whenever they are spotted can help to protect your home. 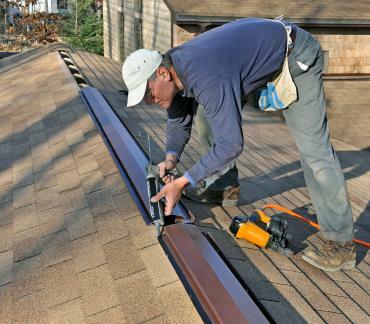 Not every caulk on the market is created equal, and what may be the best exterior caulk for your roof may not be the best choice for sealing your window casements. When stopping gaps around your home, be sure to take several things into account, such as the type of material being sealed and the climate where you live. Silicone caulk is a clear, flexible material that is most often used on roofs. It can also be used with vinyl siding and occasionally on Masonite. It cannot be painted, so don't use it around window casements or other areas where you may want to apply paint. Silicone caulk lasts the longest amount of time, but can be difficult to apply evenly and must be cleaned up using mineral spirits. If you live in a harsh climate, or don't mind seeing the clear caulk, it makes the best choice to use all over your home because it will last up to 50 years. Polyurethane caulk can be used anywhere on your home's exterior and can be painted. It doesn't last as long as silicone, but makes a good all-purpose caulk that can work with any material. If you have wood siding or window casements in your home that require caulk, elastomeric caulk is the best choice. This highly flexible caulk is made for use with porous materials like wood that could dry out other caulks too quickly. It can be painted to match its surroundings. There are several other types of caulk on the market, but most do not work well in exterior situations. Latex, butyl and acrylic caulks should all be kept to interior applications only; using them on your home's exterior will only lead to cracks in the caulk that need to be repaired within just a few years. Caulk is one product where it pays to spend a little more money. Look for products that say "high performance" and that have a warranty of at least 30 years. Weigh the pros and cons of using an all-purpose caulk that's easier to clean against one that is specific to the material you are working with. Some caulks are geared toward brick, vinyl or wood specifically, and will give you the best performance. While freshly applied caulk can last up to 50 years, not every gap in your home may be filled at once. Take the time to inspect your home twice a year and check for cracking or old caulk, as well as any gaps that may have formed through house settlements. Protecting your home with caulk can save you time and money in the future, so inspect often and use the best quality caulk you can find every time.